6. It’s a paradise and romantic destination, which is perfect for a first trip after the baby is here. 2. Getting there is already an adventure without a baby, imagine with one. Though these two cons didn’t let us down, we knew the effort would pay off, and right we were! 1. Freedom and flexibility. Definitely not the same when you have a 2,5 months old in your arms. We couldn’t for example, go diving, though we managed to go snorkeling. Or we also couldn’t go to the beach whenever we wanted to because of the high temperatures for the baby at some times of the day, and so on. 2. There were many things we couldn’t always do together, as depending on the time or Baby M’s mood, someone had to stay behind with her. We didn’t consider using the service of a babysitter as our baby was only 2,5 months old. 3. I don’t know what was more exciting, the first time when we went as a couple and went snorkeling together for the first time in paradise, or when we went as parents and took our baby girl to swim in the sea for the first time. No, there is nothing like showing the world to your baby. 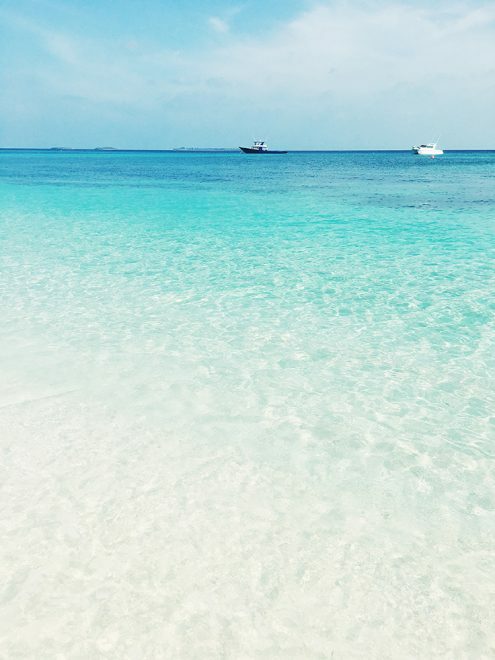 These were the major differences we noticed when we compared both our trips to the Maldives, and even though we had to compromise a lot, something we didn’t have to the first time, we believe that the key to enjoy it it’s not to plan or expect too much. Instead, just keep in mind it will be different with a baby and enjoy the time together as a family. 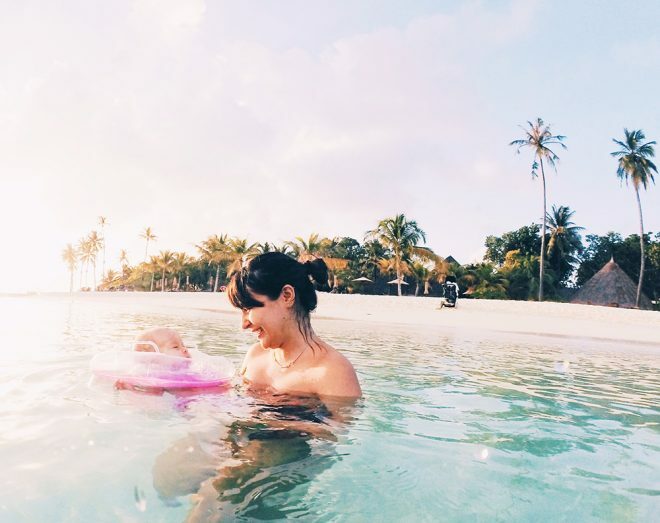 Though we would have loved to dive in the Maldives, we were also more than happy not to and stay cuddling with our baby girl. It doesn’t matter where you’re coming from, you will arrive at Malé’s International Airport. Then from there, depending on which island your hotel is located, you will need to take a seaplane or a boat to reach it. Your agency or hotel will advise you and arrange a transfer for you. Despite being a small airport, Malé’s International Airport offers a “Mother’s room” where you can change your baby’s diaper and breastfeed (though this room is before the boarding area, before the security check). Unfortunately, once you pass the security check, the only place you will have to breastfeed your baby comfortably will be the bathroom, because, let’s not forget you’re in a Muslim country and you can’t really breastfeed in public, even though there you will find reserved seats for families. Good to know: depending on the hotel you’re going to stay they may have a lounge area, which you can use at the seaplane airport for free. There you can storage your luggage, use their bathrooms, have something to drink and relax a bit before your flight. Also, there is a shuttle that takes passengers from the international airport to the local one, they are only 10 minutes away from each other. ♦ It’s not uncommon to have to stop on other islands before you get to yours. If you never traveled to the Maldives before and doesn’t know how it’s like to visit the islands, know that each island is a hotel. There are bigger islands, where the hotels have over 400 rooms, many restaurants and activities, and there are the smaller islands with way less rooms, such as 70. The smaller ones tend to be more expensive and exclusive, though it doesn’t mean they offer any less activities than the bigger ones. A plus side of the small ones are the heath of the corals. What to look for in a hotel/resort? If the budget is not a problem, preferably look for a small island. They are more private and intimate. If you want to save a bit more, look for a bigger island. 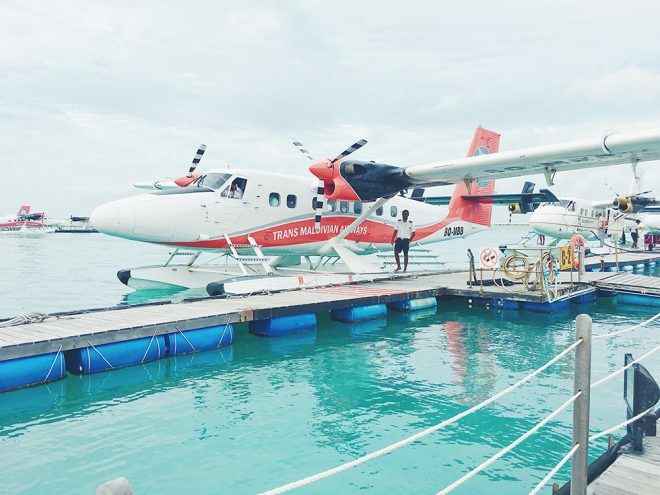 What’s most important is that the hotel/resort is child friendly (offers a baby cot and baby sitters if it’s your case) and isn’t too far from Malé’s airport (which will make the seaplane journey faster) nor too close (these tend to be less secluded and busy with boats passing my all the time). All the rest depends on what kind of activity you and your partner are expecting to do. 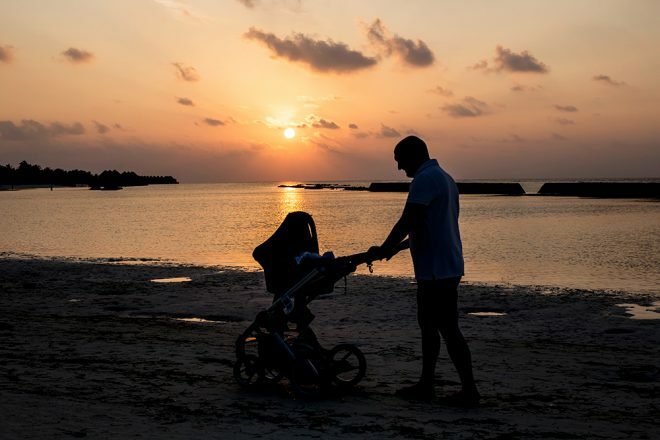 Should you take a stroller to the Maldives? This was our biggest question before our trip. I mean, it’s an island, there will be sand and the ocean, not to mention it’s one more thing to carry. Well, we decided to take ours and it was the best decision. It was very practical to walk around the island, or when we went to the restaurant, or when we were waiting to board the seaplane when leaving from the island. It was also a good asset to protect the baby from the sun, and it ended up not being one more thing to carry, but rather an accessory to help us carry small items and hand luggage around. So yes, take the stroller with you, but also take a baby carrier, another essential item. Diapers: remember that you’re going to an island and there won’t be a drugstore or supermarket where you can get diapers when you need them. Make your calculation and take with you the amount of diapers you will need during your stay, plus a few extra ones for the journeys. Everything you normally use for diaper changing on the go. Breastfeeding scarf: very useful for the plane journey and public areas. Buoy ring for the baby’s neck: this was probably one of our best buys in 2017. Baby M. could swim freely in the ocean with one of these and we had a lot of fun seeing her enjoying it. Stroller and Baby carrier: really, take both! Muslins: they are never enough, are they? Light clothing: short and long arms onesies, dresses, shorts, etc. Medicine and thermometer: talk to your paediatrician and ask what he/she recommends for you to take. We took medicine for fever, nose sucker and salt water solution (which ended up being very useful as Baby M. got a running nose during the flight journey), and cream for mosquito bites. Soap: to quickly wash your baby’s clothes. Baby food: in case your baby is already eating (Baby M was still only breastfeeding when we were there). Baby bathtub: preferably the foldable ones. 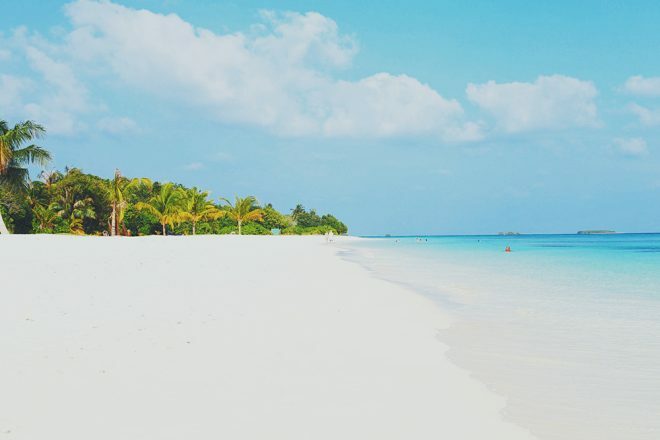 The Maldives can reach quite high temperatures, so keep your baby hydrated. If you’re breastfeeding like I was, you will notice your baby will need to feed more often. Also, preferably go to the beach early in the morning and later in the day, avoiding the hot temperatures outside. 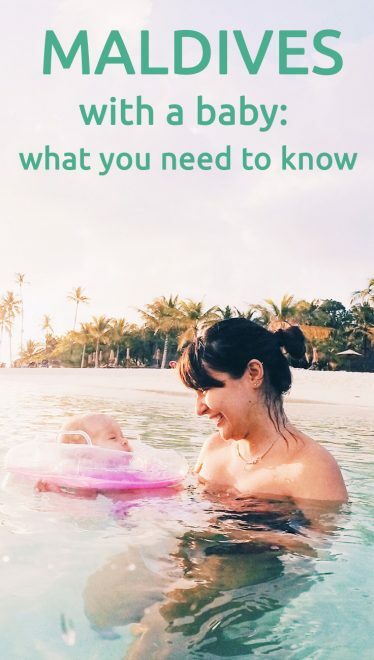 Previous to our trip I had lots of questions about breastfeeding in public, especially because I was still a newbie in this motherhood world. So if like me you’re also wondering, yes, you can breastfeed in the public areas of the hotel, though discreetly. I had a breastfeeding scarf, which was very handy. If there is any other specific information you would like us to include here, let us know. If not, we hope the information provided is helpful to you, either to influence your decision or to help you plan your trip.